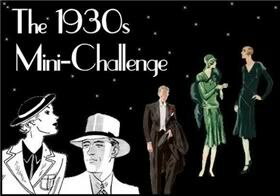 You’ve read about Nymeth’s 1930s Mini-Challenge, right? Well, I could go on about how I shouldn’t join more challenges or whatever but we all know that the important thing here is making book lists. Ha. So, yes I’m joining in on the fun. Thank you Nymeth for the challenge! The sign up post has all the details on the challenge so take a peek over there and join in. Meanwhile let me tell you which books I found on my shelves that would be perfect. If you’ve read any of these and have some recommendations let me know. Rumour of Heaven by Beatrix Lehmann. Miranda Mirova is the finest dancer of her generation. Her husband is a man of letters, and together they shine at the centre of cultured society. Then Clare the first of their three children is born and Miranda never dances again (this is a Virago Modern Classic book). Taking Changes by Molly Keane. Since the death of her parents, Roguey, Maeve and Jer have cared for one another and for Sorristown, their elegant home. Together they have fished and hunted, unravelled secrets by bedroom fires and sipped gin cocktails. But this pattern of intimacy is about to be broken by Maeve’s marriage to Rowley. Mariana by Monica Dickens. This is the story of a young English girl’s growth towards maturity in the 1930s.We see Mary at school in Kensington and on holiday in Somerset; her attempt at drama school; her year in Paris learning dressmaking and getting engaged to the wrong man. The Death of the Heart by Elizabeth Bowen. Portia, an orphan, comes to live in London with her half-brother, Thomas, and his wife, Anna. A child of sin raised in a series of shabby French hotels, Portia is possessed of a kind of terrible innocence. I also have two mysteries I’m considering, both written during the Golden Age of Detective fiction: Artists in Crime by Ngaio Marsh and ABC Murders by Agatha Christie. Oh I had fun looking through my stacks in search of potential reads. Anyway, who all is joining? Thank you for joining, Iliana! And I’m tempted to steal your reading ideas 😉 Mariana is on my Persephone mental wishlist, and I’ve been meaning to read something by Bowen for quite a while. I look forward to your thoughts on those. If you’re reading Marianna you could time it with Persephone week in May. I wish I could join, but there’s simply no room on my challenge schedule. ooh now I have a Molly Keane book on my shelf too. Didn’t realise that she would fit in the challenge. I am hoping to read Nightingale Wood by Stella Gibbons for it. Can’t wait to get started. I’m doing this too…I figure I can do a challenge if it’s just one book. 🙂 I haven’t picked my book yet, though, so I better get to it! I would happily read any of these: unchecked, books for this challenge could easily eclipse all my other reading! Have fun with the challenge Iliana! It was a hard one for me to resist but I have sworn off all challenges so I did manage to resist but I was tempted, very tempted! I look forward to your reviews! I would definitely go with Elizabeth Bowen — and Death of the Heart is one of her best; Bowen is a superb stylist, and I think you’ll be hooked on this author after one book. I think this challenge is very inviting (both for it’s gorgeous button and the books of that time period!) but I am so far resisting temptation – we will see how long that lasts! Hello Everyone – Glad to see so many of you signing up. I just know I’ll be reading reviews of books I want to read from all of you! For those of you who aren’t signing up, you are missing out 🙂 I totally understand. I have had to show quite a bit of restraint lately! I said I’m not joining challenges this year but will read along with some featured readings. I love the 1930s and this one sounds good. I need to surf around and see what everyone’s reading. I loved Mariana! This sounds like a challenge that would be right up my alley. I think I won’t formally join but will read along in spirit! 🙂 Great choices. I read a lot of Marsh’s books years ago, but honestly don’t remember any off hand. I liked them enough to read all that the library had; maybe it is time to refresh my memory.